Center on the Developing Child (2009). Five Numbers to Remember About Early Childhood Development (Brief). These five numbers illustrate the importance of early childhood to the learning, behavior, and health of later life and explain why getting things right the first time is easier and more effective than trying to fix them later. cerebral cortex. Cambridge, Mass: Harvard University Press, 1959. The early years matter because, in the first few years of life, more than 1 million new neural connections are formed every second. * Neural connections are formed through the interaction of genes and a baby’s environment and experiences, especially “serve and return” interaction with adults, or what developmental researchers call contingent reciprocity. These are the connections that build brain architecture – the foundation upon which all later learning, behavior, and health depend. Source: Hart, B., & Risley, T. (1995). Meaningful differences in the everyday experiences of young American children. Baltimore, MD: Brookes. Early experiences and the environments in which children develop in their earliest years can have lasting impact on later success in school and life. Barriers to children’s educational achievement start early, and continue to grow without intervention. Differences in the size of children’s vocabulary first appear at 18 months of age, based on whether they were born into a family with high education and income or low education and income. By age 3, children with college-educated parents or primary caregivers had vocabularies 2 to 3 times larger than those whose parents had not completed high school. By the time these children reach school, they are already behind their peers unless they are engaged in a language-rich environment early in life. Significant adversity impairs development in the first three years of life—and the more adversity a child faces, the greater the odds of a developmental delay. Indeed, risk factors such as poverty, caregiver mental illness, child maltreatment, single parent, and low maternal education have a cumulative impact: in this study, maltreated children exposed to as many as 6 additional risks face a 90-100% likelihood of having one or more delays in their cognitive, language, or emotional development. Early experiences actually get into the body, with lifelong effects—not just on cognitive and emotional development, but on long-term physical health as well. A growing body of evidence now links significant adversity in childhood to increased risk of a range of adult health problems, including diabetes, hypertension, stroke, obesity, and some forms of cancer. This graph shows that adults who recall having 7 or 8 serious adverse experiences in childhood are 3 times more likely to have cardiovascular disease as an adult. And, children between birth and three years of age are the most likely age group to experience some form of maltreatment–16 out of every thousand children experience it. Sources: Masse, L. and Barnett, W.S., A Benefit Cost Analysis of the Abecedarian Early Childhood Intervention (2002); Karoly et al., Early Childhood Interventions: Proven Results, Future Promise (2005); Heckman et al., The Effect of the Perry Preschool Program on the Cognitive and Non-Cognitive Skills of its Participants (2009). Providing young children with a healthy environment in which to learn and grow is not only good for their development—economists have also shown that high-quality early childhood programs bring impressive returns on investment to the public. Three of the most rigorous long-term studies found a range of returns between $4 and $9 for every dollar invested in early learning programs for low-income children. Program participants followed into adulthood benefited from increased earnings while the public saw returns in the form of reduced special education, welfare, and crime costs, and increased tax revenues from program participants later in life. All of society benefits from investments in early childhood programs. Suggested citation: Center on the Developing Child (2009). Five Numbers to Remember About Early Childhood Development (Brief). Retrieved from www.developingchild.harvard.edu. *The number “more than 1 million new neural connections per second” updates an earlier estimate of 700-1,000 new connections (which still appears in some of the Center’s printed publications, but as of April 2017 has been updated online and in all PDFs). All of these numbers are estimates, calculated in a variety of different ways, but we are making this change in our materials after a careful review of additional data that were called to our attention. The Center is deeply committed to a rigorous process of continuous refinement of what we know and an ongoing pledge to update that knowledge as additional data become available. The development of a child’s brain architecture provides the foundation for all future learning, behavior, and health. Brain architecture is comprised of billions of connections between individual neurons across different areas of the brain. These connections enable lightning-fast communication among neurons that specialize in different kinds of brain functions. The early years are the most active period for establishing neural connections, but new connections can form throughout life and unused connections continue to be pruned. 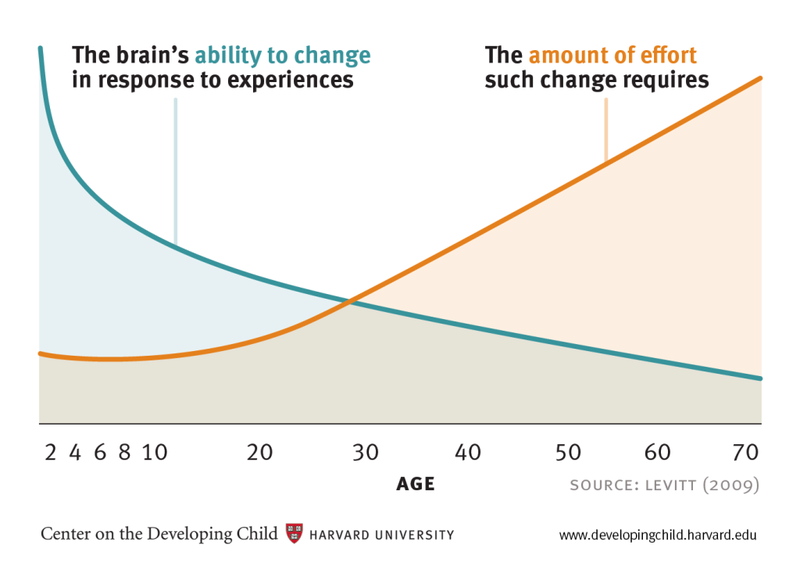 Because this dynamic process never stops, it is impossible to determine what percentage of brain development occurs by a certain age. 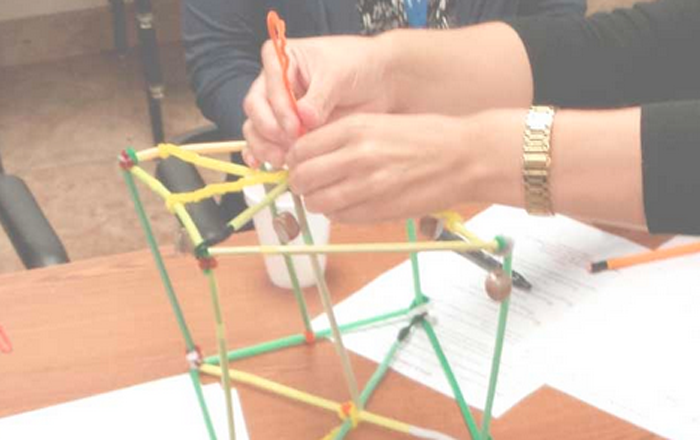 More importantly, the connections that form early provide either a strong or weak foundation for the connections that form later. The interactions of genes and experience shape the developing brain. Although genes provide the blueprint for the formation of brain circuits, these circuits are reinforced by repeated use. A major ingredient in this developmental process is the serve and return interaction between children and their parents and other caregivers in the family or community. In the absence of responsive caregiving—or if responses are unreliable or inappropriate—the brain’s architecture does not form as expected, which can lead to disparities in learning and behavior. Ultimately, genes and experiences work together to construct brain architecture. 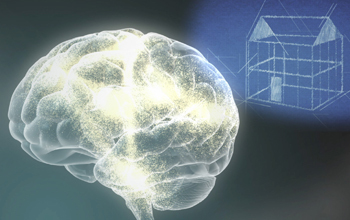 The Brain Architecture Game was designed to help explain the science of early brain development—what promotes it, what derails it, and what the consequences are for society.